Was it the rain? Or was it Chris Gayle and Marlon Samuels? West Indies needed 81 to win from 37 balls with six wickets remaining when a hailstorm ended the first semi-final of the World T20, leaving Sri Lanka winners by 27 runs by the Duckworth-Lewis method. Gayle made 3 off 13, and Samuels was unbeaten on 18 off 29 when the rain came down. Darren Sammy said it was disappointing to go out under the rain rule, and refused to answer when he was asked whether West Indies could afford Gayle and Samuels taking as much time as they did. When he was asked a related question about the high number of dot balls faced by Gayle and Samuels, Sammy admitted that both had not been able to deliver in this tournament, but said that both had performed in the past. "When you lose a cricket game, people tend to point out all different areas where that should have happened, this should have happened," Sammy said. "But I am sure if you look at all the games we have played, there are more than 27 dots [25, between Gayle and Samuels]. "Probably 50-something dots. It's not ideal for Twenty20 but we've developed a formula in which that works for us. We know we are a boundary-hitting team. We know we have got to improve in rotating the strike but if you look at the way Gayle plays, he normally gives himself some time to get used to the wicket and catch up in the end. But the thing is, in this tournament he has not carried. "Marlon has not been batting well for us. It is one area - we always tell him, whatever rate you walk into, you try to keep it at that or increase it. Yes, we could say Marlon has not had the best of tournaments but he is one of our better batsmen and in the last World Cup (in 2012), he was the star for us. People have a few dips in form." West Indies began with 17 runs off the opening over but scored only 13 off the next five of the fielding restrictions. Sammy and Dwayne Bravo had catapulted them home against Australia in a tense chase and also nearly doubled the score against Pakistan in the last five overs. The captain pointed to that and said West Indies could have pulled it off again. "Gayle and [Dwayne] Smith have a very clear idea of how they want to go and play. The first over, we were off to a flyer but they brought on the offspinner (Sachithra Senanayake) and (Lasith) Malinga who bowled really well at Gayle and Smith. We were again behind the eight-ball and just when Bravo looked like picking it up like he did in the last game, he got out but we still had the belief that we could get 12 runs an over in the last six. I guess we have been doing that in this tournament. It is just disappointing but there is nothing we could do about it." Sammy praised Sri Lanka for their display and said the rain gods had intervened because they wanted Kumar Sangakkara and Mahela Jayawardene, both of whom will be retiring from T20 internationals at the end of the tournament, to win a world limited-overs title after four losses in finals in 2007, 2009, 2011 and 2012. 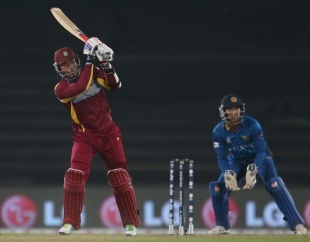 "Disappointing to come out of the tournament like this but credit to Sri Lanka. They won the toss, batted first. Probably they knew that some (bad) weather was around. But we have had a good run in this tournament, it is just sad that we got knocked out by the D/L system. But that's life. You move on and we will start planning for the next T20 World Cup. "I took it like 'you know what, we have won a World Cup'. We are a praying team, we know God normally answers our prayers but today, I guess two gentlemen who have played for Sri Lanka, given a lot not only to Sri Lanka cricket but cricket on the whole, I guess the Almighty wants them to leave on a high, so I guess they have one more game to try and win a World Cup and leave on a high. Probably that's the reason why God put a hand in this match. I am sure I will have another shot at playing the T20 World Cup and we are looking forward to winning it again in the near future."